So he considered other reasons that have been raised before: “cutting-edge companies need less physical capital than they did in the past and more money in the bank unless somebody comes along with a takeover bid” or that “the people running companies are dominated by short-term performance targets and the need to keep shareholders sweet”. There is some element of truth in all these possible explanations for ‘the gap’ between corporate earnings and investment that opened up in the early 2000s. But I don’t think that corporate investment is abnormally low relative to cash flow or profits. The reason for low business investment is simpler: lower profitability relative to the existing capital invested and the perceived likely returns for the majority of corporations. I have dealt with this issue before in previous posts and in debate with other Marxist economists who deny the role of profitability in directing the level of corporate investment and, ultimately growth in production in the major capitalist economies. 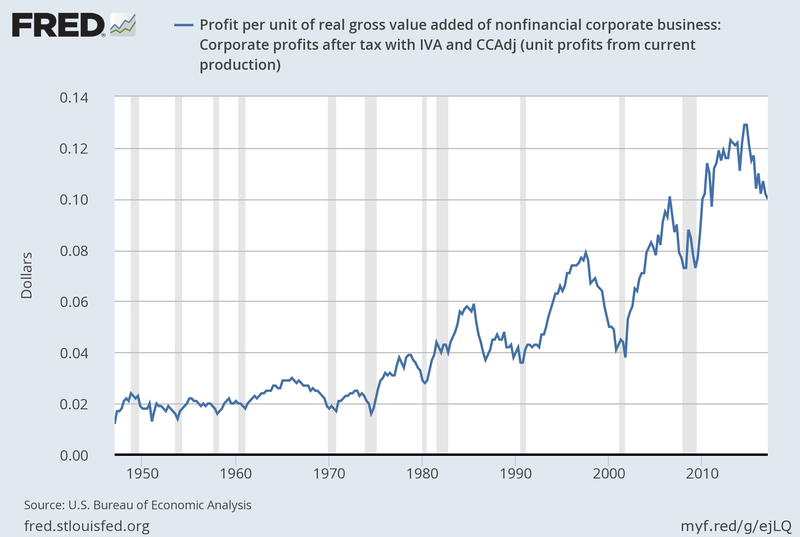 The point is that the mass of profits is not the same as profitability and in most major economies, profitability (as measured against the stock of capital invested) has not returned to the levels seen before the Great Recession or at the end of neoliberal period with the dot.com crash in 2000. And the high leveraging of debt by corporations before the crisis started is acting as a disincentive to invest and/or borrow more to invest, even for companies with sizeable amounts of cash. Corporations have used their cash to pay down debt, buy back their shares and boost share prices, or increase dividends and continue to pay large bonuses (in the financial sector) rather than invest in productive equipment, structures or innovations. For example, look at the UK’s corporate sector. Sure the mass of profits in non-financial corporations has jumped from $40bn a quarter in 2000 to £85bn now. And it may be true that “the return on capital is the best it has been for the best part of two decades”, as Elliott claims. But it is all relative. The rate of return on UK capital invested has dropped from a peak of 14% in 1997 to 11.5% now. Profitability recovered after the Great Recession trough of 9.5% in 2009 but it is still below the peak prior to the crash of 12.3% in 2006. And UK profitability has stagnated since 2014, prior to Brexit. 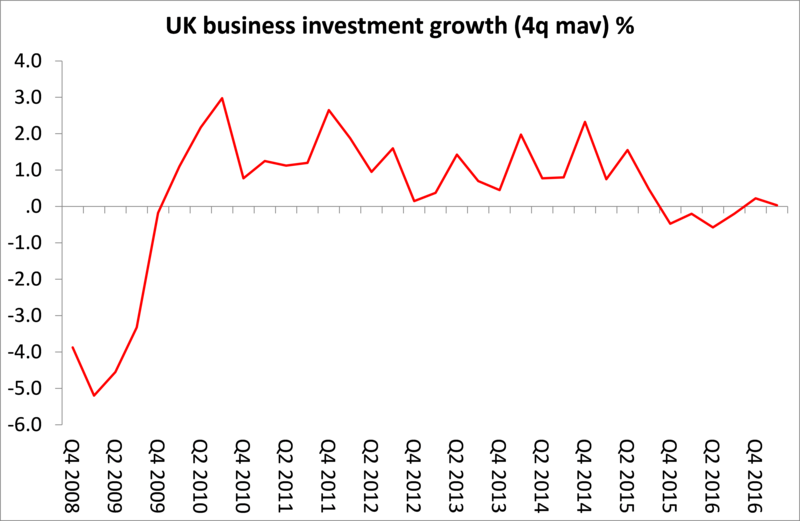 Thus it should be no surprise that UK businesses have stopped investing in productive capital. It’s the same story in the US, where not only is the average profitability of US corporations falling, but so are total profits in the non-financial sector. Profit margins (profits as a share of non-financial corporate sales) measure the profit gained for each increase in output and these have been falling for some quarters. 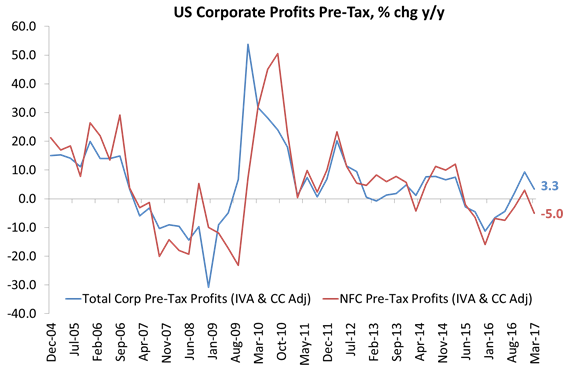 And more recently, total profits in non-financial corporations have been contracting. 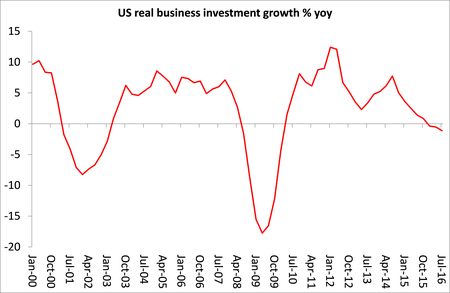 So again, it is no surprise that business investment is also contracting among US corporations. I have dealt before with the argument that Elliott offers again that companies are “awash with cash”. First, it is only a small minority of very large companies like Apple, Amazon, Microsoft etc that have large cash hoards. The majority of companies do not have such hoards and indeed have increased levels of corporate debt. And there is a sizeable and growing minority that have profits only sufficient to service their debt interest with none left for expansion and productive investment. According to the Bank for International Settlements, the share of these ‘zombie’ companies has climbed to over 10%: “the share of zombie firms – whose interest expenses exceed earnings before interest and taxes – has increased significantly despite unusually low levels of interest rates”. Based on the simple Marxist formula for the rate of profit of capital s/c+v, where s= surplus value and c= constant capital and v= variable capital, I used the following AMECO categories. s = Net national income (UVNN) less employee compensation (UWCD); c = Net capital stock (OKND) inflated to current prices by (PVGD); v = employee compensation (UWCD). From these data series, I calculated the rate of profit for each of the major capitalist economies. Of course, the AMECO categories do not match proper Marxist categories for many reasons. But they do give cross-comparisons, unlike national statistics. And my results seem reasonably robust when compared with national data calculations. For example, when I compared the net rate of return on capital for the US using the AMECO data and Anwar Shaikh’s more ‘Marxist’ measure for the rate of profit in US corporations for 1997-2011, I found similar peaks and troughs and turning points. The results for profitability in the major capitalist economies, using the AMECO data, confirm that the rate of profit is lower than in 1999 in all economies, except Germany and Japan. Japan, by the way, still has the lowest rate of profit of all the major economies. Indeed, the level of the rate of profit is highest in the UK, Italy and an enlarged EU (which includes Sweden and Eastern Europe), while the lowest rate of profit is in the US and Japan. All countries suffered a severe slump in profitability during the Great Recession, as you might expect. 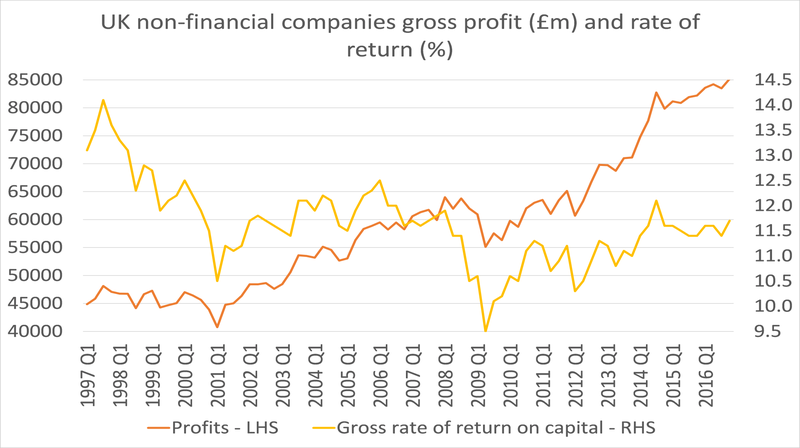 Then profitability recovered somewhat after 2009. But, with the exception of Japan, all economies have lower rates of profit in 2016 than in 2007, and by some considerable margins. And in the last two years, profitability has fallen in nearly all economies, including Japan. The table below shows the percentage change in the level of the rate of profit for different periods. 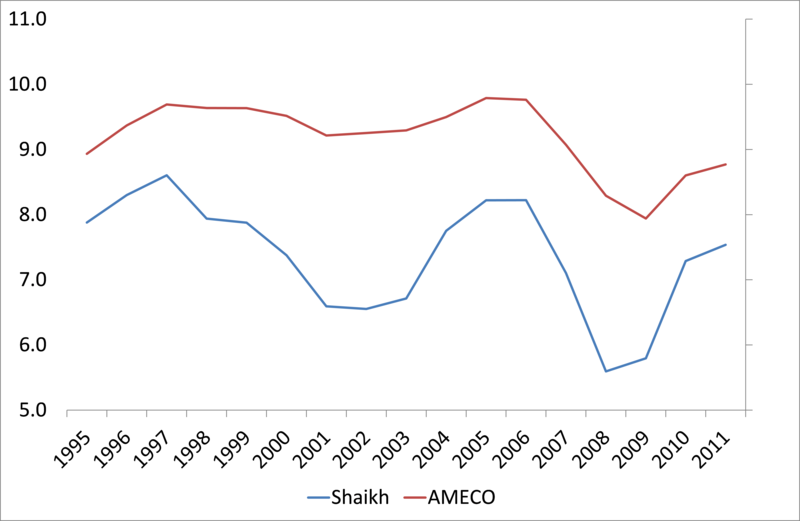 So the AMECO data show that profitability is still historically low and is now falling. 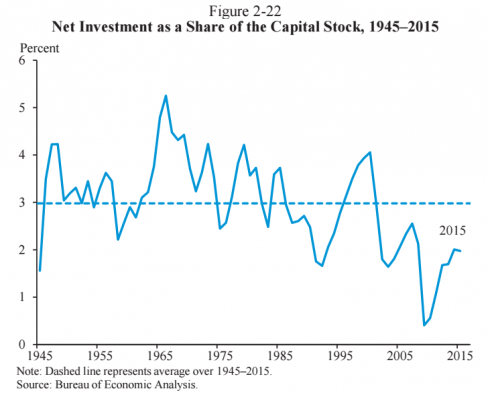 No wonder business investment in productive capital has remained weak since the end of the neo-liberal period (graph below for the US) and now is even falling in some economies. This entry was posted on July 26, 2017 at 12:40 pm and is filed under capitalism, economics, marxism, Profitability. You can follow any responses to this entry through the RSS 2.0 feed. You can leave a response, or trackback from your own site. In my opionion baded on my finished PhD research project, it is due to financialisation and market concentration..
Japan and The Germanic Europe steal value from the rest of the world. These two regions are the most productivities when we talk about industrial production. The answer is fairly simple. As Marx points out in Theories of Surplus Value, although capitals in Department I to an extent produce for the sake of production to both replace in kind their own constant capital, and to accumulate additional capital, ultimately, he says, there is only a point in Department I accumulating if it is to meet the needs of additional means of production from Department II, and Department II does not accumulate additional means of production unless it can see increased demand for its output. As Marx points out in TOSV it is not the rate of profit that is decisive here, for capital, but the potential for realising additional masses of capital. What capital is concerned with is not producing larger theoretical profits, but larger masses of actually realised profits, which requires that what has been produced, and contains the surplus value, can actually be sold at prices that realise those profits. Profits may be high, but if additional capital accumulation, and output cannot be sold at such prices, thereby realising that profit, there is no reason for capital to make that investment. At a time when, in Britain and the US, particularly, over the last thirty years, wages have been squeezed, and profits thereby increased, the only way to realise those theoretical profits is either to export the output, or to get the workers whose wages have been squeezed, to continue buying by using ever increasing amounts of credit to do so. “This is indeed the secret basis of glut.”, i.e. of overproduction. So, in conditions where wages are falling in real terms, where austerity is being used to hold back economic growth, for fear of causing interest rates to rise, which would crush the massively inflated asset prices that now form the main form of private capitalist wealth, its no wonder that the high profits continue to feed into financial speculation rather than real capital accumulation. And, that is the second obvious reason that high profits are not going into capital accumulation. For the last thirty years yields have been on a steady fall to zero and beyond. Speculators are no longer primarily concerned with a search for yield but with a search for rapid capital gains, or at least means to prevent the fictitious capital prices from collapsing. Central banks have obliged them, by buying up all of the surplus government and corporate bonds, so as to keep their prices inflated. Why would any owner of loanable money-capital, including companies use it for additional real capital investment, in conditions where they know there is no significant growth in demand, when they can instead safely park that money in shares, or bonds whose prices the state is guaranteeing with its purchase of those assets? And, of course, the other effect of this is that it constricts aggregate demand further too, because anyone with surplus cash, and facing negligible returns on savings, or annuities, is encouraged to also use it for speculation into bonds, shares, or property, driving those asset prices higher still, and sucking money out of commodity-circulation. Meanwhile, whilst all available loanable money-capital goes into this financial speculation, driving asset price bubbles, it also means that loanable money-capital available for real capital investment by small and medium size companies becomes in short supply, so that either those companies cannot get loans, or else the interest rates on these loans is around 10% p.a. But, even that level seems quite moderate compared to the rate of interest that ordinary workers face of 30% on the credit acrs many now depend on to get to the end of the week, or the 4000% p.a. they face on payments to Pat Day lenders, in order to get to the end of the month. Really? Thirty years of yields below zero? In what instruments? Emerging market bonds? Not hardly? Junk bonds? Again not hardly. Speculators have NEVER been primarily concerned with the search for yield, i.e. interest rates as a “thing in itself,” but rather the total return available in the shortest-term possible. Whether it be in the currency exchange markets, or in pork bellies, or in gold. One more example of the same old nonsense from Boffy– where it all, and always, comes down to underconsumption. Just for grins and giggles, take a look at the following indices of bond yields– JP Morgan Emerging Market Bond; JP Morgan Global Bond; Barclay’s US Corporate Intermediate Term Bond; Barclay’s US Treasury 3 month Bellweather. Only the US Treasury 3 month goes to near zero with the onset of the big recession. Yields certainly decline, but are not near zero for the other three, with the EM and Global Bond Indices at about 6 percent, down from 7.5% in early 2008. A well researched posting and a good comment by Boffy. There are a number of confounding factors. With the spike in depreciation, particularly after the capitalisation of I.P., net investment has become unreliable and is understated simply because depreciation is overstated. I have made this clear in my last posting, yet again, and have quantified it. In turn the overstatement in depreciation has deflated the net stock of capital which together with variable capital (not annual compensation) acts as the denominator in the rate of profit. Secondly, an adjustment is needed for the top 1% of wage earners. Taking all this into account, the peak in US profitability took place mid-2014 and has since fallen sharply reversing the growth in investment. In reality, if we cut out the noise in GDP, the US economy contracted in q4 2015 and q1 2016. So the linkages are there. This quarter appears to be the first spike in global profits for the top 1000 corporations, a gift from China to re-anoint Xi. It will be interesting to see what transpires at the end of the year given that the global credit pulse has now fallen below 0%. Also of interest is the contrast in the profits of the large corporations and the smaller. While profits increased last quarter for the S&P, they fell for the economy as a whole. This means the large global corporations are squeezing the smaller corporations many of whom act as suppliers to them. 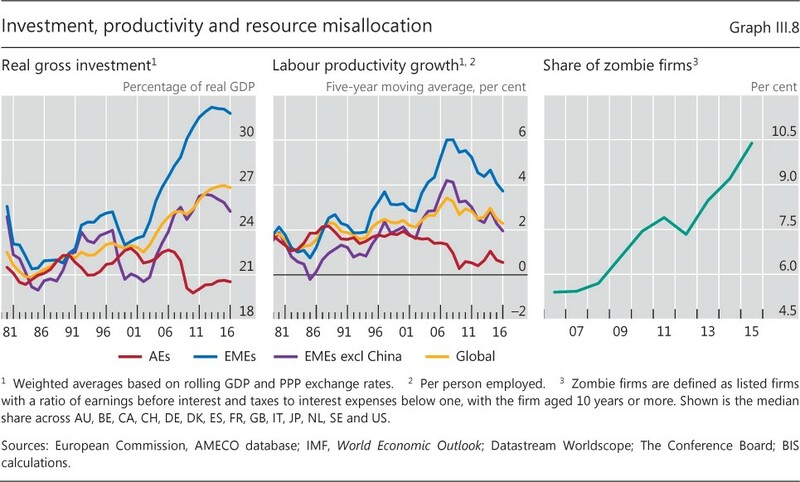 It is not so much the presence of Zombie companies as it is this centralisation of profits that is acting as a brake on investment. The problem is at the top not the bottom. If Google and Facebook steal all the advertising revenue, hundreds of newspapers and television studios collapse and with them the investments they made traditionally in both variable and constant capital. BEA has just revised down the growth rate for both Q4 2015 and Q1 2016 as part of today’s Q2 GDP release. One more downward revision and those two quarters will show no growth or outright contraction despite the 1% boost from duplications and imputations. This reinforces the point I have made of the importance of the profit decline since 2014. Sartesian. I just checked on original release. Original BEA release, stated corporate pre-tax profits with IVA and CCA for q4 2015, (the trough) = $1890 billion annualised. Latest release $1598 billion. Trust that clarifies the matter. Appears that some of the downward revision has to do with downgrading corporate profits. forgot to add for that quarter. “Corporate profits was revised down $11.5 billion, or -0.5 percent, for 2014, was revised up $29.4 billion, or 1.4 percent, for 2015, and was revised down $12.4 billion, or 0.6 percent, for 2016. It’s quite possible that profits were revised down for that quarter but revised up for the full year….. regardless…. …regardless I have a bit of a problem when people claim the BEA figures are inaccurate, can’t be trusted, are distorted, etc. etc. and then seize on BEA revisions to prove the point. If the BEA figures can’t be trusted, then neither can the revisions be trusted. This is why I emphasize that we need to look at the trend over time, and if the BEA figures consistent with the trend, the movement of the economy over time, as indicated by separate sources– like the FRB, or the Dept of Commerce Annual Survey of Manufacturers, etc. Overall, corporate profits in 2016 were reported as below the profits for 2015, which explains a bit of the impetus that put Trump in office in the US, and the grand alliance among the Koch Bros, the Nazi-alt rights, Trump, Goldman-Sachs graduates, and the like. Anyway, arguing about the accuracy of BEA figures is a bit like arguing that batting average in baseball, or a pitcher’s earned run average doesn’t tell the whole story. Of course it doesn’t. The figures do give us a reference point however against which we can measure further developments.